Research & Education Association, 9780738608884, 225pp. Are you crunched for time? Have you started studying for your Advanced Placement(R) Statistics exam yet? How will you memorize everything you need to know before the test? 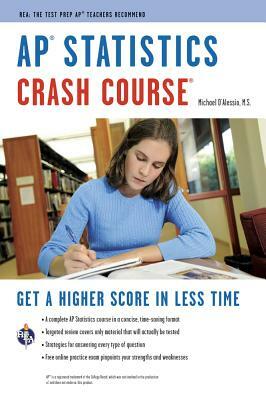 Do you wish there was a fast and easy way to study for the exam AND boost your score? The Crash Course is based on an in-depth analysis of the AP(R) Statistics course description outline and actual AP(R) test questions. It covers only the information tested on the exam, so you can make the most of your valuable study time. Written by an experienced AP(R) Statistics teacher, our easy-to-read format gives you a crash course in exploring data, planning a study, anticipating patterns, and statistical inferences. After studying the material in the Crash Course, go to the online REA Study Center and test what you've learned. Our free practice exam features timed testing, detailed explanations of answers, and automatic scoring analysis. The exam is balanced to include every topic and type of question found on the actual AP(R) exam, so you know you're studying the smart way. Whether you're cramming for the test at the last minute, looking for extra review, or want to study on your own in preparation for the exams - this is the study guide every AP(R) Statistics student must have. Michael D'Alessio earned his B.S. in Biology from Seton Hall University and his M.S. in Biomedical Sciences from the University of Medicine and Dentistry of New Jersey. In 2004, he earned his Executive Masters of Arts in Educational Leadership from Seton Hall University. Mr. D'Alessio has had an extensive career teaching all levels of mathematics and science, including AP(R) statistics, chemistry, biology, physics, algebra, calculus and geometry. In 2003, Mr. D'Alessio received the Governor's Teacher of the Year recognition for Watchung Hills Regional High School. In 2004, Mr. D'Alessio received a Certificate of Recognition of Excellence in Science Teaching from Sigma Xi, the Scientific Research Society of Rutgers University and in 2005, he was voted National Honor Society Teacher of the Year by the students of Watchung Hills. Currently, Mr. D'Alessio serves as the Supervisor of the Mathematics and Business Department at Watchung Hills Regional High School in Warren, New Jersey, overseeing 30 teachers. Michael D'Alessio earned his B.S. in Biology from Seton Hall University and his M.S. in Biomedical Sciences from the University of Medicine and Dentistry of New Jersey. In 2004, he earned his Executive Masters of Arts in Educational Leadership from Seton Hall University. Mr. D'Alessio has had an extensive career teaching all levels of mathematics and science, including AP(R) statistics, chemistry, biology, physics, algebra, calculus and geometry. In 2003, Mr. D'Alessio received the Governor's Teacher of the Year recognition for Watchung Hills Regional High School. In 2004, Mr. D'Alessio received a Certificate of Recognition of Excellence in Science Teaching from Sigma Xi, the Scientific Research Society of Rutgers University and in 2005, he was voted National Honor Society Teacher of the Year by the students of Watchung Hills. Currently, Mr. D'Alessio serves as the Supervisor of the Mathematics and Business Department at Watchung Hills Regional High School in Warren, New Jersey, overseeing 30 teachers.